From 95 to 205 € the night I book ! This 18th century mansion is located near the Gorges de l'Ardèche and the chateaux of the beautiful Drôme Provençale. Swimming pool and pleasant courtyard. The decor in the rooms tells the story of the trip to China of a former house owner and trader. Each room is different, a step on the silk route, but all are superbly decorated, spacious and comfortable. Varied cuisine. Friendly welcome..
- accueil de réceptions et séminaires. 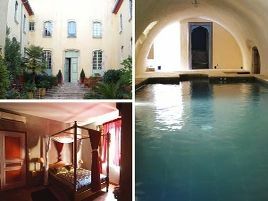 - espace Bien-Être avec piscine intérieure et hammam. 2 suites and 6 rooms with bath or shower, WC and TV. For the rooms,107 euros (1 pers. ), 117 euros (2 pers.). For the family suites and apartment, 169 euros (3 pers. ), 205 euros (4 pers.). Extra bed 10 euros. Apartment and family house also for rent. Babysitting, games and children's meals. Family suites. sur les quais du Rhône à 50 m de la mairie. The closest station is Pierrelatte, located at 3 km. The closest airport is Nîmes-Alès-Camargue-Cévennes , to 70 km.